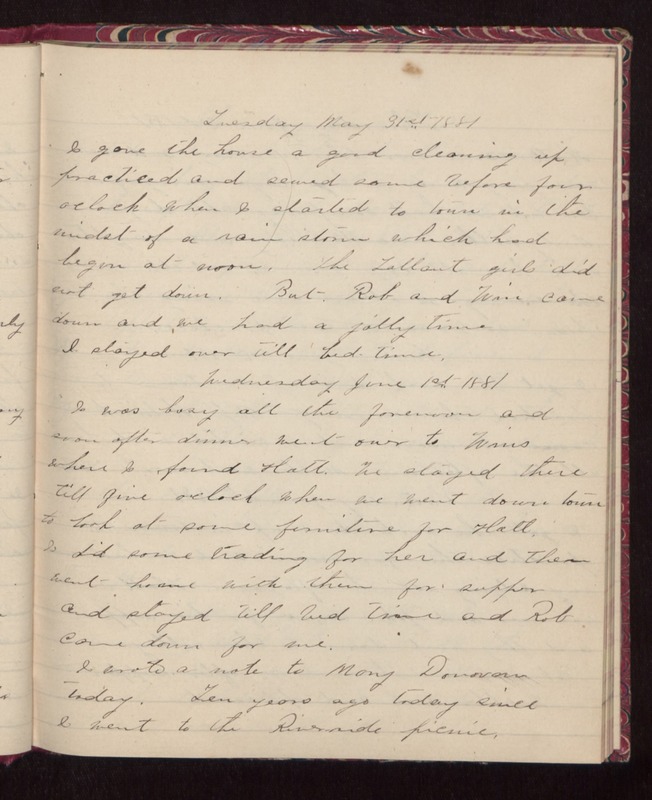 Tuesday May 31st 1881 I gave the house a good cleaning up, practiced, and sewed some before four oclock when I started to town in the midst of a rain storm which had began at noon. The Tallant girls did not get down. But, Rob and Win came down and we had a jolly time. I stayed over till bed-time. Wednesday June 1st 1881 I was busy all the forenoon and soon after dinner went over to Wins where I found Hatt. We stayed there till five oclock when we went down town to look at some furniture for Hatt. I did some trading for her and then went home with them for supper and stayed till bed time and Rob come down for me. I wrote a note to Mary Donovan today. Ten years ago today since I went to the Riverside picnic.